‘Breakfast is the most important meal of the day’ is a phrase that was probably drummed into most of us from an early age. Whether or not you follow this rule in your everyday life, it’s certainly one to abide by on the mountain. On average, downhill skiing and snowboarding can burn around 300 to 600 calories per hour. When you consider how many hours you put in, that’s a pretty good workout! Plus, being at altitude puts extra strain on the body and increases the metabolic rate. This makes it even more important to eat fat, protein and slow release, low GI carbs at the start of the day, to slow down energy release and ensure you’re fit for a full day on the slopes. To help you fuel up for the mountain, we asked award winning foodie chalet company AliKats Mountain Holidays to share a few of their breakfast recipes. Here are three delicious breakfasts recipe ideas to kick start your day on the slopes. This healthy, vegetarian breakfast combines protein with tasty veggies and feta for extra flavour. Quick and easy, this recipe is sure to become your new go-to morning meal. This recipe can be adapted for vegetarians by eliminating the bacon. Either way, the avocado and lime combo packs a flavour punch. 1. Preheat the oven to 180°C. Put the tomatoes in a small roasting tin and cook for 15 minutes, or until softened and just starting to split. 2. Meanwhile, fill a large pan with water and bring to the boil; add the vinegar. Cut the avocados in half and scoop out the flesh into a bowl (discard the stone). Add half the lime juice, and some salt and pepper. Using the back of a spoon, roughly smash the avocado, until chunky but spreadable. 3. Preheat the grill to its highest setting. Brush the baguette slices with oil on both sides and toast for 1-2 minutes on each side. 4. Poach the eggs in the pan of boiling water for 2-3 minutes, until the whites are set but the yolks are still runny (or as preferred). Remove with a slotted spoon and drain on kitchen paper. 5. Spread the toasted baguette with the smashed avocado and divide between 4 plates, along with the roasted tomatoes. Top each with a poached egg and season with some freshly cracked black pepper. Serve with a drizzle of hot pepper sauce, if you like, and two rashes of bacon. 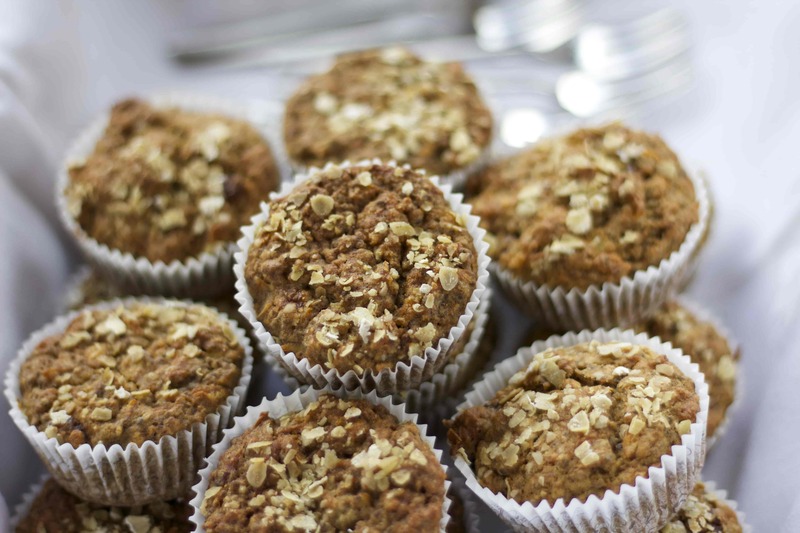 These carrot, apple and chia seed muffins are both diary and gluten free, and are great for breakfast on the go. Make a batch and freeze them for powder days, when you need to get out the door and onto the slopes quick! 1. Preheat the oven to Gas Mark 4/ 180°C/ fan 160°C. Line a 12-hole muffin tin with paper cases. 2. In a large bowl, mix the grated carrot and apple, four spice powder, orange zest, chia seeds, sugar, 1/4 tsp salt, oil and eggs, until combined. 3. Set aside for 5 minutes, or until the chia seeds have expanded a little. Meanwhile, sift the flour, baking powder and bicarbonate of soda into a separate bowl. 4. Stir the carrot mixture into the dry ingredients to form a batter. Divide evenly between the muffin cases and then scatter over the oats. 5. Bake for 15-18 minutes, or until risen and springy to the touch. Remove from the oven and leave to sit for 5 minutes, before arranging the muffins on a wire rack to cool completely. For more recipes and food inspiration check out AliKats Mountain Holidays’ food blog; A Need to Feed. If these recipes have made you hungry for some time on the slopes, you might want to think about booking your next skiing holiday. To make the most out of your trip, a ski transfer from Alps2Alps will whisk you to your chosen resort in no time. Fantastic discounts and offers, friendly drivers and 5-star trip advisor reviews. Book an Alps2Alps ski transfer to get the most bang for your buck!